Every summer I think how lucky I am to live in the Niagara region. This area has some of Ontario’s Every summer I think how lucky I am to live in the Niagara region. 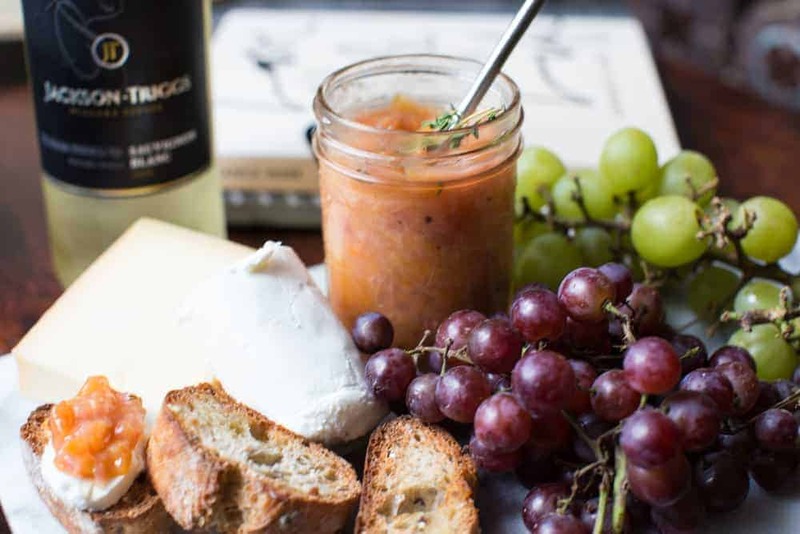 This area has some of Ontario’s best wineries and it's also home to countless farmers markets. Every summer I think how lucky I am to live in the Niagara region. 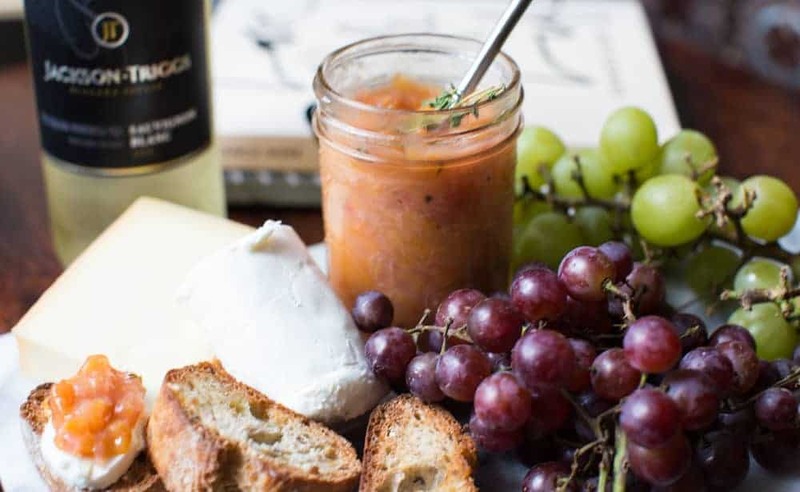 This area has some of Ontario’s best wineries and it’s also home to countless farmers markets. From fragrant strawberries to the juiciest peaches, a trip to the market leaves me inspired and usually ends up with me baking a galette (Blueberry with vanilla bean ice cream on top? Mmm yes please!!) 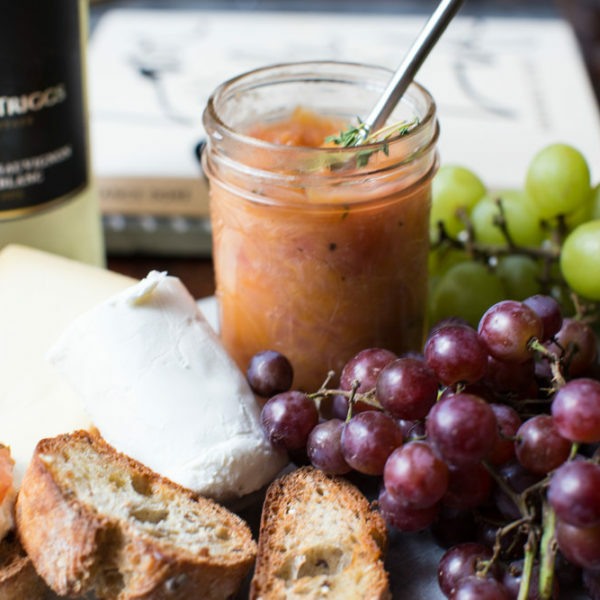 putting together a cheese and fruit board to have with a chilled glass of Sauvignon Blanc, or making jam. Jam is just the perfect topping for toast slathered with butter or cream cheese, and when baking a vanilla cheesecake, add blueberry jam on top and a few dollops of lemon curd and you are set. There is something about summertime and spending a morning simmering your favourite fruit, especially if it is with wine (brownie points!) I love making a few batches to keep our pantry stocked and gift to friends. A few of my favourites made the ingredients list. 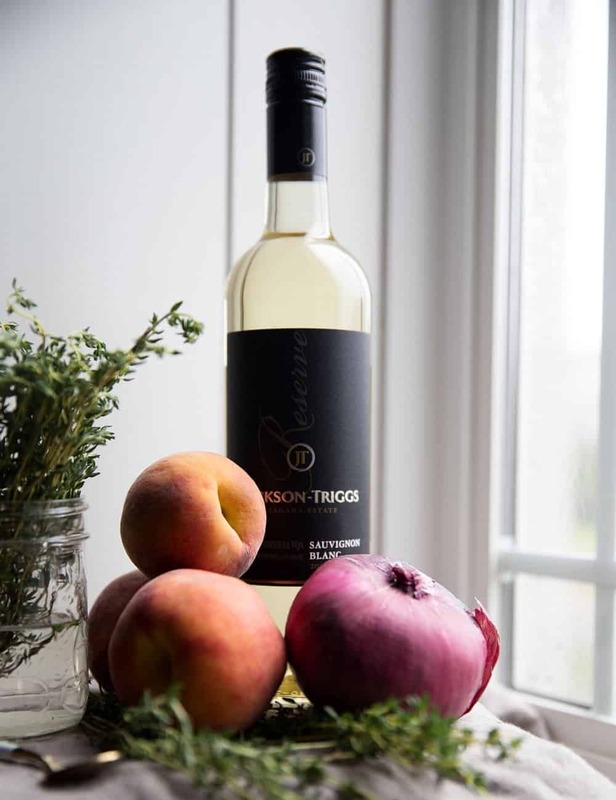 To start, local Ontario peaches, blueberries, Jackson-Triggs Sauvignon Blanc, Merlot, Greek olive oil from a recent trip to Athens and Thyme, a herb that I should definitely use more often. While my playlist set the mood with Alt-J, my jam session began. I wish I could have bottle the smell of the peaches cooking with the wine and thyme. Done in 30 minutes and ready to serve soon after, this my friends, will be a regular in your fridge. Who knew savoury jams were so delicious? Just imagine it topping thick slices of sourdough bread with Ricotta or added as a finishing touch to grilled salmon. Even as a salsa for fish tacos! 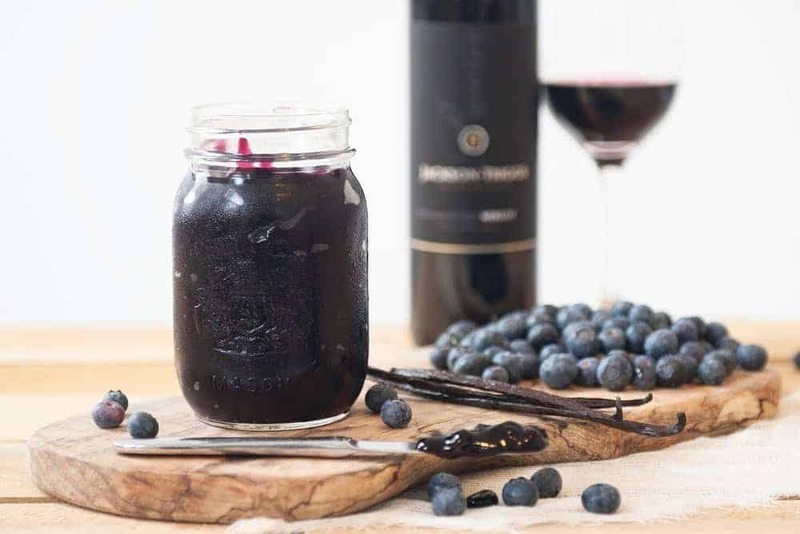 As for the Blueberry and Merlot jam, be prepared to put it on pretty much everything. The wine brings out the sweetness and flavour of the berries and goes well with cheese and pastries. This will be your next brunch’s hit. Place a medium pot over medium heat and add in two tbsp of olive oil. when the pot is hot, add the onions and garlic. Cook while stirring until tender (roughly 3-5 minutes). Next add in the peaches, honey, Sauvignon Blanc and water. gently simmer for 15 minutes or until the peaches are tender. Mix together the corn starch and cold water until it forms a smooth paste. Whisk in lime juice, chopped thyme and corn starch mixture and continue to simmer for an additional 5 minutes. Season with salt and pepper. 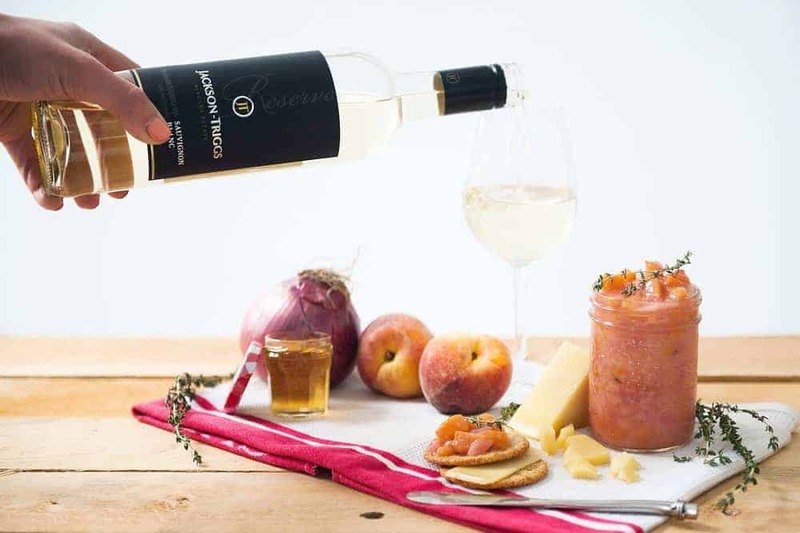 How can you enjoy this savoury peach jam? Add some jalapeño and serve cold a top freshly shucked oysters and pair with sparkling wine. Turn into a salsa and serve with fish tacos. Bake a wheel of Brie and remove the top rind, then add the peach jam while it’s still hot. pair with Jackson- Triggs Reserve Riesling. Mix cornstarch with cold water into a paste in a small bowl. Pour into the simmering berries and stir immediately. Continue to cook for an additional 5 minutes, then pour into prepared (sterilized jars). This post was made in collaboration with Jackson-Triggs however all views and opinions are my own. Recipes by Chef Tim MacKiddie.